Let’s say you are at the DELHI, and it is a really hot day. You order up among of your favorite beer. 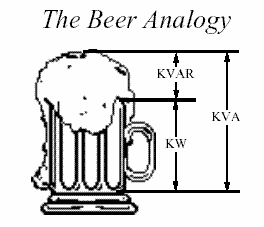 The thirst-quenching portion of your beer is represented by KW (Figure 1). The total content of your mug, KVA, is this summation of KW (the beer) and KVAR (the foam). • The more foam you have (the higher the percentage of KVAR), the lower your ratio of KW (beer) to KVA (beer plus foam). Thus, the lower your power factor. • The less foam you have (the lower the percentage of KVAR), the higher your ratio of KW (beer) to KVA (beer plus foam). In fact, as your foam (or KVAR) approaches zero, your power factor approaches 1.0. In order to have an “efficient” system (whether it is the beer mug or Mac dragging a heavy load), we want power factor to be as close to 1.0 as possible. Sometimes, however, our electrical distribution has a power factor much less than 1.0. Next, we’ll see what causes this. Since power factor is defined as the ratio of KW to KVA, we see that low power factor results when KW is small in relation to KVA. Remembering our beer mug analogy, this would occur when KVAR (foam, or Mac’s shoulder height) is large. What causes a large KVAR in a system? The answer is…inductive loads. Reactive power (KVAR) required by inductive loads increases the amount of apparent power (KVA) in your distribution system. This increase in reactive and apparent power results in a larger angle θ (measured between KW and KVA). Recall that, as θ increases, cosine θ (or power factor) decreases. So, inductive loads (with large KVAR) result in low power factor. Why Should we Improve My Power Factor ? Recall that inductive loads, which require reactive power, caused your low power factor. This increase in required reactive power (KVAR) causes an increase in required apparent power (KVA), which is what the utility is supplying. So, a facility’s low power factor causes the utility to have to increase its generation and transmission capacity in order to handle this extra demand. By raising your power factor, you use less KVAR. This results in less KW, which equates to a dollar savings from the utility. As mentioned above, uncorrected power factor causes power system losses in your distribution system. As power losses increase, you may experience voltage drops. Excessive voltage drops can cause overheating and premature failure of motors and other inductive equipment. So, by raising your power factor, you will minimize these voltage drops along feeder cables and avoid related problems. Your motors will run cooler and be more efficient, with a slight increase in capacity and starting torque. Copyright © Universal Power Factor Corrector All rights reserved.